AUX is proud to host Eric Laska presenting Anne-F Jacques and Tim Olive. Ethan Tripp and Jim Strong will share the bill. Anne-F Jacques and Tim Olive use handmade, idiosyncratic instrumentation to produce and amplify detailed sound textures, from fine-grained to coarse. Anne-F’s “rotating devices” refer to small electric motors which are modified, manipulated and amplified; Tim’s “magnetic pickups” are the engine of a devolved one-string electric guitar. 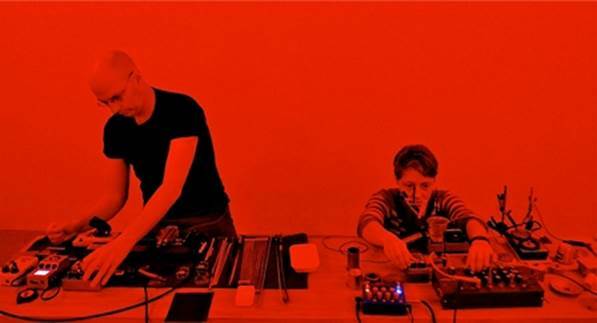 They share a tactile, lo-tech approach to improvised sound composition, manipulating diverse objects and materials in conjunction with somewhat unpredictable audio pickup/amplification systems to create a music in turns serene and agitated, pellucid and dense, fluid and gritty. Their collaboration began in July 2013, when Japan-residing Olive was in Montreal for a series of performances. A day of recording in Jacques’s studio resulted in “Dominion Mills”, a CD released on 845 Audio in 2014 which received excellent critical reviews. The duo then organized a tour of Japan in November 2014, where they played in Kyoto, Osaka, Kobe, Nagoya and Tokyo, performing as a duo and with local musicians, including Takahiro Kawaguchi and Makoto Oshiro. Ethan Tripp is an electro-acoustic improvisor whose work focuses on exploration of the materials of every-day sounds and silence. The principal devices for sound production are simple objects like radios and speakers, accompanied by junk like bicycle spokes and bits of discarded metal. Like Free Improvisation with no technique, Sound Art with no art, and playing sounds largely unwelcome in most areas of music, he seeks to formulate an experience out of the trash of the sonic world, the tension of expectation, and the certainty of unfolding time. Jim Strong is an experimental instrument builder and visual artist. His Instruments are built intuitively utilizing Crank Mechanisms, Strings, Broken Electronics and pressurized air. He Plays solo and in variable group improvisations and works collaboratively in Dance, Video and Theater.